Soon every character on Stranger Things will have its own fan theory. As giddy viewers of Netflix's breakout summer hit continue to pick apart the show's many unanswered questions -- and propose some surprising Parks and Recreation connections along the way -- it has become harder to separate reasonable conjecture from speculation that makes about as much sense as shotgunning a beer can with a knife. But one theory involving Eleven, the show's resident telekinetic badass, has emerged as a possible key to unlocking the whole series. With her psychic powers, strong fashion sense, and E.T.-like love of Eggos, Eleven is the show's most beloved character (sorry, Barb), capable of inspiring intricate fan art on brick walls and human flesh in equal measure. So, it only makes sense that Eleven would get her own mind-blowing theory. The theory asks a simple question: what if Eleven is actually the monster? Crazy, right? Or is it? Let's take a closer look at the theory and see if it would hold up to Chief Jim Hopper's dogged investigative skills -- of if it would break into a million pieces like Jonathan's cool camera after it gets smashed by the bullies. As the above video from Uproxx helpfully explains, this theory is all about duality. When Eleven first encounters the blood-loving monster, she's in a sensory deprivation tank -- not in the alternate dimension known as the Upside Down. When we see Eleven in the blank nothingness space, which resembles the place Scarlett Johansson took her victims to in Under the Skin, we are watching her create the monster in her mind, possibly as a side effect of her telekinetic powers and the drug-testing inflicted on her by Matthew Modine's twisted father figure. The tank scenes are an important part of the puzzle. Then there's the climatic showdown between Eleven and the monster, which takes place in the show's final episode. As many fans have noticed, she even says, "I am the monster," echoing an idea that Lucas raises at various points in the show. Of course, it's possible that she's speaking metaphorically -- like many science-fiction and fantasy heroes, Eleven is inextricably linked to her nemesis -- but for the purposes of this crazy theory, let's take her comment literally. What if the monster is the Upside Down version of Eleven? This theory could explain why she disappears into a cloud of ash following the big throw-down: in order for the monster to leave, she must also sacrifice herself. As fans on Reddit have pointed out, the theory would also help explain why Eleven is able to recognize Will and Barb in photos without ever having met them. If true, her powers connect her to the monster because they are, in fact, one and the same. And when Chief Hopper leaves a care package in the woods at the end of the finale, he's not just providing comfort to our favorite Mad Max: Fury Road cosplayer; if the theory is true, he's sustaining the enemy. In addition to its killer '80s soundtrack, Stranger Things is packed with references and allusions to beloved science-fiction stories, from John Carpenter movies to Stephen King novels. (The show's detractors would say a little too packed.) For the "Eleven is the monster" theory, the most important allusion occurs early in the first episode, when Will and Dustin get in a bike race in which the winner gets a comic. But it's not just any comic: Will asks for X-Men 134. For superhero junkies, that number set a fire in their brains -- and it's safe to assume the Duffer Brothers wanted comics-savvy viewers to make that connection. As writer Alex Abad Santos at Vox carefully explains, that specific issue, which was published in 1980, marks the beginning of the comic's iconic Dark Phoenix saga. The story line centers on the psychic Jean Grey and her battle with the Phoenix, an evil force that drains Grey of her powers and threatens to destroy the universe. "The Phoenix uses Jean Grey as a host, while Stranger Things’ monster is more independent," writes Santos. "It doesn’t seem to need Eleven to live or die." 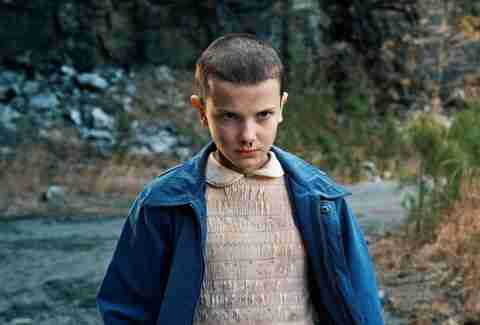 The "Eleven is the monster" theory refutes that with its conclusion that the monster and Eleven need each other. 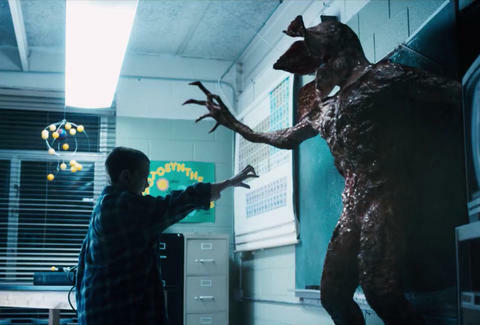 As the Uproxx video suggests, perhaps the relationship between Eleven and the monster is more similar to the Demogorgon from Dungeons and Dragons, which the boys fight during a campaign in the show's first episode. That creature, straight out of The Monster Manual, has two heads, each of which have distinct personalities, much like the vastly different personalities of the monster and Eleven. The two heads of the Demogorgon are in constant battle but also need each other to survive. So, does this theory check out? Like most fan theories, believing that Eleven is the monster on Stranger Things requires interpreting many symbolic, thematic, and metaphoric elements of the story as literally as possible. It takes a show filled with mysteries and ambiguities, and demands all those aspects conform to a "twist" that's never fully explained in the text itself. Obviously, Eleven and the monster are linked -- even the most basic reading of the show would acknowledge that -- but are they really the same? That will be the most interesting part of this theory going forward, whenever Netflix inevitably announces a second season. Judging from what we see in the show, Eleven genuinely cares for Mike and his friends. Only in episode five, when she directs the compass away from the laboratory, does she deliberately attempt to sabotage their efforts to find their friend and uncover the mysteries of the Upside Down. If she's secretly a villain, she's doing a bad job. Also, it's clear from the final episode that this isn't a Tyler Durden-style situation. As viewers, we see them share the frame together, and other characters watch them do battle as well. Instead, a looser interpretation of this theory could suggest that Eleven is the monster yet somehow exists independently, as if the monster were the flip-side version of Eleven. And while a stoner's post-bong-hit observation in support of this corollary might go, "Dude, the number 11 reads the same right side up and upside down -- whoa!" one thing connecting Eleven and the monster is a certainty: the monster and Eleven probably both enjoy Eggos. Because, seriously, what kind of monster doesn't love a good Eggo? Dan Jackson is a staff writer at Thrillist Entertainment, and he's waiting for the Officer Callahan fan theory. He's on Twitter @danielvjackson.